For people that have either no teeth, or failing or failed dentition. Or people who are unhappy with dentures. This can refer to a number of situations in which teeth can be placed upon implants on the day of placing implants. However most of these have been discussed elsewhere and in this section we will focus on the current common understanding of this term. Many variations in naming exist including: same day teeth, fixed implant teeth, one day smile treatment, etc. What does this technique mean? used to treat a falling or terminal dentition in which all the teeth need to be extracted, it is often the case that the teeth are extracted on the same day as the placement of the implants with fixed teeth also being provided on the same day. A number of branded systems have been developed with some characteristics unique to each brand. Perhaps the most well known one is the “All on 4” technique of the Nobel Biocare company. 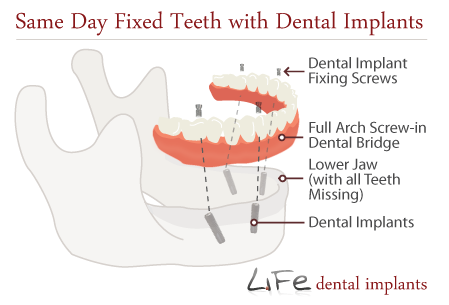 However it needs to be stressed that most implant systems have the capability for a same day fixed technique. Another well known system is the one from the German company Bredent. 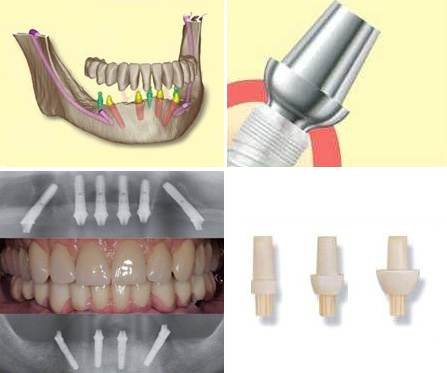 Their system is called “Fast and Fixed” and uses their SKY implant system but essentially the principles are the same as the All on 4 technique but with one important difference; fast and fixed does not limit itself to only 4 implants. Usually in the upper jaw 6 implants are used and grafting is carried out where necessary. In the lower jaw 4 implants are still generally used. Dr Sheikh has completed courses in both of these techniques and here at Life we offer both techniques at the practice. Provide fixed teeth in one day. Avoid long treatment plans that can extend to months or years. Provide all initial extractions, implant surgery and fixed teeth in one day. Avoid where possible complex grafting such as sinus grafts in the upper jaw and nerve repositioning in the lower jaw or onlay grafting in either. Reduce the time and cost of the treatment. What are the disadvantages of this technique? Most dental implant surgeons cannot do this treatment. Not all patients are suitable as is actually the case with almost any technique. Generally speaking the final restoration will be a metal acrylic bridge – these can be regarded as fixed dentures. However bridges in other materials can be made usually at additional cost. This is only a disadvantage if a patient desires natural, single implant crowns. This is a type of the treatment described above and is a brand of the Nobel Biocare company. This branded technique was devolved in conjunction with an eminent Portuguese dentist Dr Paolo Malo. It again is designed to achieve the aim of providing fixed teeth in a day. implants regardless of the anatomy and the patient is made to fit the technique as opposed to the more usual other way round. In this technique the two back implants in the jaw are angled backwards to allow a spread so that the bridge can be spread over a smaller number of implants. Also the need to graft is significantly reduced. The technique involves implants that are angled at the back to avoid sinus grafting in the upper and nerve repositioning in the lower jaw and by dint of this does have advantages. However as usual not this nor ANY other technique is guaranteed to be suitable for all patients. In principle as stated above this is similar to the All on 4 technique and teh implants are aligned in a similar way to allow the bridge to be screwed into teh implants. The upper jaw is bridged with 6 implants as opposed to 4 but the lower jaw is often restored with 4, although 6 implants is not uncommon at all. Patients who have a failing or terminal dentition where decay and/or gum disease has rendered extraction of a full set of upper or lower teeth to be necessary or advisable. Patients who are wearing removable dentures and wish to have fixed teeth. Patients who cannot tolerate the palate on the upper denture that causes them to gag. Patients who do not have the budget, time or inclination for a conventional full set of fixed teeth involving grafting or complex surgeries. This is often at an enquiry stage when options are discussed, and the patient’s suitability dentally and medically is assessed for implant treatment. A detailed consultation and assessment. This is an essential and very important part of the process when a very detailed and focussed discussions will be had. The assessment includes X Rays, CT Scans, photos, impressions and other records. All this information will then be collated, assessed and a detailed treatment plan formulated. A report will be sent out to the patient with all relevant information including findings, a record of the discussion and a detailed treatment plan including the fees. The day of the surgery. until such time as the implants can be placed or until they are strong enough to be loaded. Some time is then taken to fabricate the acrylic bridge during which time the patient may rest. Once the bridge has been constructed it is connected to the implants, the bite and aesthetics are refined and the patient is sent home with fixed teeth. which may be the next day or more usually about 2 weeks later when they are checked to see that all is well. Minor modifications can be made at this stage. which is stronger and much more durable than the acrylic one. 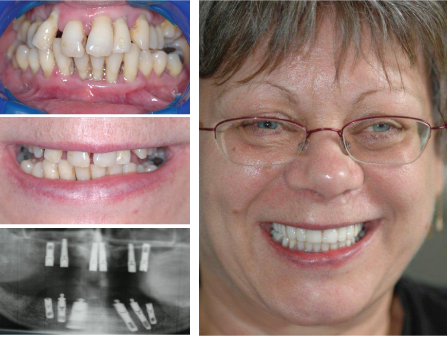 This bridge can be modified before finish to include such changes as the patient may require and that are possible. These second bridges can be made in other materials such as metal fused to porcelain or all ceramic. However these are much more expensive to provide and much more difficult to service if they need any attention in future years. We generally recommend the metal acrylic bridge in these cases. This phase may involve new impressions a try in prior to fitting of the finished bridge. The review of the final bridge.